Memories by AmyInKy: "Mom...Kevin fell and his tooth fell out..."
Isn't that what every mom wants to hear??? 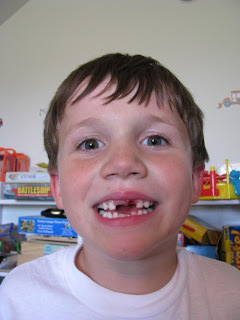 Luckily for Kevin, the front tooth Blake was referring to was already (very) lose. It didn't make me feel much better though knowing that one of my kids hit the basement floor hard enough to knock out a tooth! I pray now with permanent teeth coming in (Blake's are already in!) that it doesn't happen again! Blake said Kevin fell and then he noticed something on Kev's shirt...the tooth. Blake ran to find me with tooth in hand. Kevin came soon behind holding a Kleenex up to his mouth. Tom was in Idaho yesterday, so he missed all of the excitement. Kevin called him to tell him the news. It was hillarious listening to the conversation. When Tom asked if he was ok, Kevin replied, "Yeah...I'm just holding one of those...things you use...to get boogers out of your nose...to stop the bleeding." I interrupted to explain that he had a tissue! Kevin has such a way with words. Some things that the children say and do are absolutely priceless...and it is great when you incorporate that into your scrapping...you are so good with your journalling.